As I’ve told you before, I love op shops. When I’m in the mood (and I have my trusty dad to look after Evie so I can concentrate) I love nothing more than flicking through the old patterns and clothes and books in op shops. 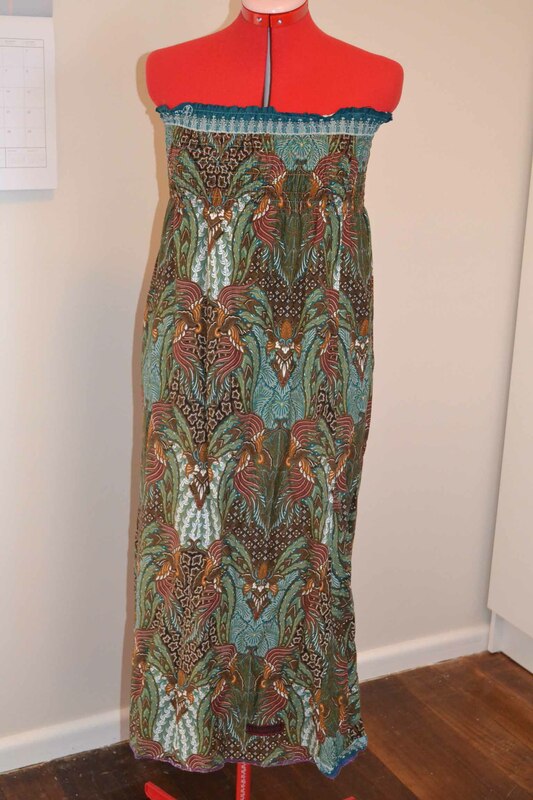 I recently found a dress in a local op shop that I immediately knew would never work on me as a dress – I simply don’t have the upper body for a strapless, ruched dress. But I also immediately loved the fabric. So…I got it home, washed it, and tried it on as a skirt…and guess what??? I actually wore it work a couple of weeks ago, with tights and boots and lots of layers on top and I was given many compliments – lovely! It is also great for a growing belly – whether you become preggers (?) or eat too much that day! What do you think of turning a dress into a skirt? is it acceptable fashionable behaviour? 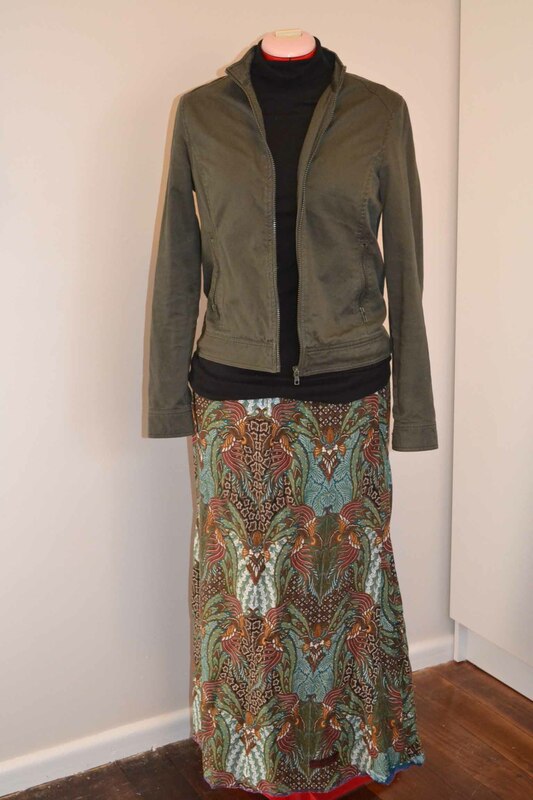 This entry was posted in Love and tagged clothing, dress, Fashion, op shops, skirt, spring day, style by sewandbakeandlove. Bookmark the permalink. 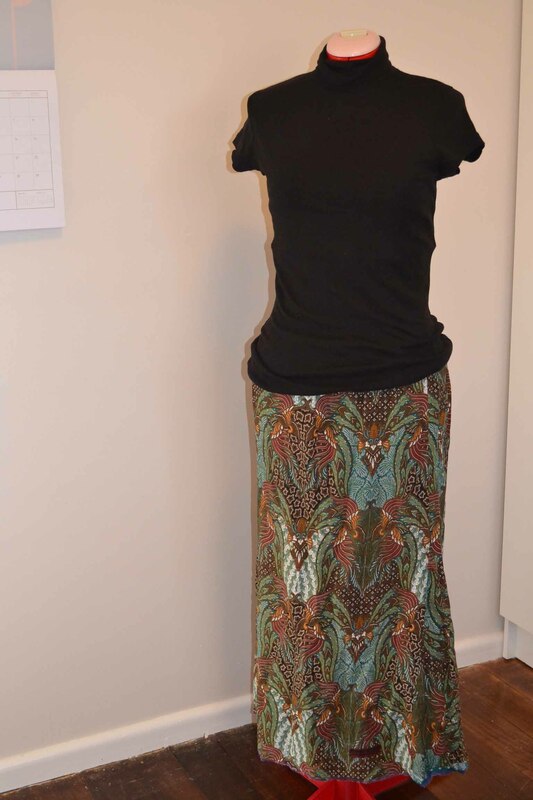 I love love love this skirt – not so much the dress. You have given me inspiration to have a look at the dresses in my wardrobe to see if the same concept can be used for these. LOVE IT! Yay! Go for it Pol! Let me know how you go! What a fantastic Op Shop find! Love how you made the dress into a skirt, you’re very talented. What a cheap, creative and easy way to add to your wardrobe, knowing that you have a one off item, created by you. Yes, I’m loving it to bits. It’ll be great in Summer too! That fabric is so fun! I love how you’ve styled it-up great find! Thanks. There are other options too, which I am excited to explore! Thanks Kaz – Nina’s costume designers are always a huge inspiration. What I love about fashion is that there are no set rules. I saw an amazing post yesterday by a funky young designer who found a vintage white knit long skirt and wore it as a dress with a fitted long black top underneath. It was stunning and one of the most stylish looks I’ve seen in ages! I think your skirt would look great with a crop pale blue denim jacket and white top too! Yes, what a great idea – the other way around. I think this would look great with white, especially as the weather warms up! Yes. yes, yes! I say turn a dress into a skirt any day!! I love the pattern on the dress. Good score at the op shop. Thanks! It’s so much fun playing ‘fashion show’!